The P value debate has revealed that hypothesis testing is in crisis – also in our discipline! But what should we do now? Nature recently asked influential statisticians to recommend one change to improve science. Here are five answers: (1) Adjust for human cognition: Data analysis is not purely computational – it is a human behavior. So, we need to prevent cognitive mistakes. (2) Abandon statistical significance: Academia seems to like “statistical significance”, but P value thresholds are too often abused to decide between “effect” (favored hypothesis) and “no effect” (null hypothesis). (3) State false-positive risk, too: What matters is the probability that a significant result turns out to be a false positive. (4) Share analysis plans and results: Techniques to avoid false positives are to pre-register analysis plans, and to share all data and results of all analyses as well as any relevant syntax or code. (5) Change norms from within: Funders, journal editors and leading researchers need to act. Otherwise, researchers will continue to re-use outdated methods, and reviewers will demand what has been demanded of them. “Scale purification” – the process of eliminating items from multi-item scales – is widespread in empirical research, but studies that critically examine the implications of this process are scarce. In our new article, titled Statistical and Judgmental Criteria for Scale Purification, we (1) discuss the methodological underpinning of scale purification, (2) critically analyze the current state of scale purification in supply chain management (SCM) research, and (3) provide suggestions for advancing the scale purification process. Our research highlights the need for rigorous scale purification decisions based on both statistical and judgmental criteria. We suggest several methodological improvements. Particularly, we present a framework to demonstrate that the justification for scale purification needs to be driven by reliability, validity and parsimony considerations, and that this justification needs to be based on both statistical and judgmental criteria. We believe that our framework and additional suggestions will help to advance the knowledge about scale purification in SCM and adjacent disciplines. Like it or not: Our discipline is very much dominated by positivism and the application of the scientific method, which assumes that new knowledge can be created by developing and testing theory or, in other words, by induction or deduction. Another type of inference is abduction. 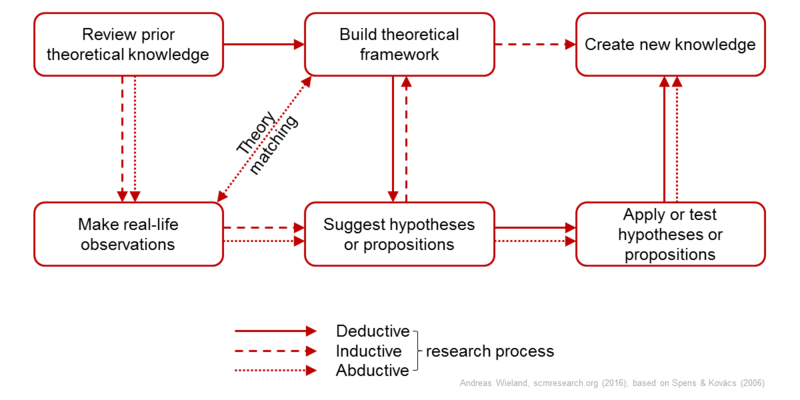 Spens & Kovács (2006) present an overview of the deductive, inductive and abductive research processes.